Editor's note: See social media coverage on our Storify page. 10th and 11th District Congressional Races: Chicago's suburbs featured two Congressional races that featured heavy TV ad buys and negative campaigning. In the 10th District, newcomer Brad Schneider edged Republican Bob Dold, 50.5 percent to 49.5 percent. Democrat Bill Foster unseated incumbent Judy Biggert in the 11th District, winning 57.7 percent of the vote. Duckworth Wins 8th District Congressional Race: The television advertisements and debates portray nothing but a competitive and tense campaign between Tammy Duckworth and Joe Walsh for the Illinois 8thCongressional District. However, the atmosphere of Duckworth’s election night party was filled with relief and admiration as the Iraq war veteran took home the win. “I’m feeling confident, feeling excited, feeling incredibly grateful,” Duckworth said before results finally came out. Duckworth had 55 percent to 45 percent for Walsh. Duckworth is a native of Thailand and served in the Iraq war where she lost both her legs. She was up against the 8th district Congressmen Republican Joe Walsh. The two immediately gained nationwide attention after multiple debates showed the two disagreeing on every issue across the board. Everything from immigration to abortion and Medicare were aspects of this campaign both candidates brashly disagreed upon. Other than not seeing eye to eye about political issues, Walsh brought personal backgrounds into the mix after saying Duckworth isn’t a “true hero.” He accused her of using her military experience as an advantage in the Congressional race. Conservation Super PAC “Now or Never” pulled nearly $2.5 million from Walsh’s campaign just days before Election Day. This money, meant to “bury” Duckworth, was then put elsewhere. “I’m very confident and ready to get to work” Duckworth said. Her supporters showed much encouragement and support for her leadership at Duckworth’s election night rally. Schakowsky Cruises in 9th District: Rep. Jan Schakowsky (D) was re-elected to her eighth term in the Illinois 9th district. With what Fox Chicago is reporting as a 66 percent majority with 96 percent of precincts reporting, she easily defeated first-time Republican candidate Timothy Wolfe. The decisiveness of her victory was reflected by her celebration in Evanston, which focused on the far more competitive Presidential election. Schakowsky left her own party after a brief statement to an audience composed of staff and colleagues at 7:30 p.m., in order to attend President Obama's election party in downtown Chicago. “I'm very hopeful my election will go just fine,” Schakowsky said, at the end of a speech that otherwise focused entirely on the Presidential elections, and other more competitive races. When her own race called an hour later, it did not raise a stir among the party attendees at Prairie Moon restaurant. According to OpenSecrets.org, the incumbent Schakowsky raised over $1.2 million for her campaign, while her opponent's fundraising fell short of $50,000. Despite that disparity, the projected 66 percent majority for Schakowsky ties the 2010 election for the smallest margin of victory of her congressional career. Her political director, Alex Armour, said he does not think this portends to more competitive races in the future, citing Schakowsky's continued success in spite of a 2002 re-districting. Rush Wins Big: Representing the Illinois 1st district, Rep. Bobby Rush won by a grand slam against Blue Island Mayor Donald Peloquin—143,562 votes to 43,885 votes. Rush made headlines earlier this year for being thrown off the House of Representatives floor for wearing a hoodie in protest of the Trayvon Martin shooting. Rush is no stranger to fighting for justice and focusing on meeting the needs of the most vulnerable—typically low-income and middle-class families and communities. Heavily favored by his constituency, Rush has served as the Chairman of the House Subcommittee on Commerce, Trade and Consumer Protection during the 111th Congress. As the winner, Rush says he intends to focus on job security, pushing for the development and expansion of small businesses throughout his district, particularly Disadvantaged Business Enterprises. His platform also focuses on issues of energy independence and climate change—he fully supports President Obama in helping the country reach that independence within the next decade. He strives to reduce the country’s dependence on oil and focusing on expanding cleaner sources of electricity. Over the years, he has brought more than $1 billion to his district. Recently, he obtained a $4.9 million federal grant in order for completion of the Bronzeville Metra Station. Low Turnout in Some South Side Precincts: Voter turnout in the 9th Precinct of Chicago’s 18th ward has been up and down since the polls open today. But with more people getting off work this evening, the numbers could increase as the polls close at 7. “This morning it was pretty busy,” said Debra Echols, a first-time precinct captain. Her polling place -- the 9th precinct -- is located inside of Hayes Park in the Ashburn neighborhood of Chicago’s South Side. “There were people here at 5:30 a.m. and lines out of the gym,” Echols said. Echols added that many people came in before work By the middle of the day, Hayes Park was pretty quiet and not many voters in the polling area. She said she believes that by evening, more voters will turn out on their way home from work. Echols said that she would be a precinct captain again. She became a precinct captain for this years election because she wanted to help President Obama win. A precinct captain, hands out cards to voters so they know who to vote for but mainly they direct them to the judges so they can get the proper ballots to vote. Chicago Board of Elections Website Crashes: The website for the Chicago Board of Election Commissioners, ChicagoElections.com, crashed amid heavy volume Tuesday morning, leaving frustrated voters scrambling to find where to vote and sample ballots. Voters experienced loading and error messages primarily between 6 a.m. and 8 a.m. The website temporarily directed people to the State Board of Elections website for more information. A makeshift "control room" was set up with about 80 election board representatives to take phone calls - which numbered over 1,200. "The Chicago Election Board website is getting deluged with unprecedented levels of traffic," said the board's communication director, Jim Allen. "We're doing our best to address a high-traffic situation which we've never seen before," Allen said. As of 6 p.m. Tuesday, the website was still running slowly. The board is referring traffic to the State of Illinois's election website. Redrawn Chicago ward maps left 20 percent of voters with new polling places. Some voters -- who had been voting at the same polling place for years - found themselves at their old precincts. Election judges were unsure of where to send the voters to their new precincts, and the website crash further complicated matters. Other issues included four of the city's 2,000 precincts not opening on time, long lines, broken voting machines and improperly issued provisional ballots. In some cases voters were legally on the rolls but told to go to another precinct. Officials will investigate the matter. Three judges had to be removed - one for being tired, one for belligerence to voters and one for intoxication. 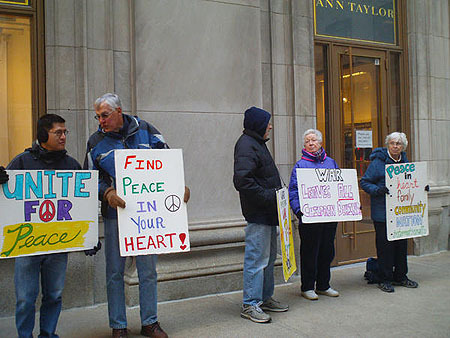 Peaceful Election Day: The Occupy Chicago movement maintained a low-key profile during Election Day 2012. Obama headquarters at Prudential Plaza (130 E. Randolph St.) was quiet minus the typical comings and goings of the morning commute. The area remained free of protesters as the day progressed. The Jackson and LaSalle intersection, a regular meeting place for Occupy members and well-known hotspot for protesters, was also unusually calm. Unlike NATO and the recent Chicago teachers’ strike, there were no traffic delays or throngs of people. The only group present was the 8th Day Center for Justice, which meets every Tuesday from 8 a.m. to 9 a.m. to hold a peace vigil in solidarity. A group of about 15 people were present Tuesday morning holding colorful, homemade signs with messages such as, “Find Peace In Your Heart” and “War is Preposterous”. Most said they took advantage of early voting or visited their designated polling place before their 8 a.m. meeting time. Despite their lack of physical demonstrations, Occupy Chicago made a few statements today via Twitter. Around 6 a.m. the group re-tweeted an Instagram photo showing two protesters holding a banner over the expressway, which read: “No Matter Who Wins The 99% Loses”. Around 11 a.m. Occupy Chicago tweeted: “‘Voting is easy & marginally useful but it’s a poor substitute for democracy which requires direct action by concerned citizens’ Howard Zinn”. Lunchtime Update: There was some confusion in Pilsen voting places. Confusion at Pilsen polls. Voters at CPL Rudy Lozano branch say they were directed to other locations, only to be sent back later. Polls and Predictions: Many news outlets have polls and predictions for the presidential race, but few have been as accurate as the statistical analysis Nate Silver has been doing on his FIveThirtyEight blog on the New York Times site. Silver's latest analysis gives Obama a 92 percent chance of winning and projects the president will receive 315 electoral votes (45 more than needed to win) to Romney's 222. Change of Heart: Research by The National Journal shows that this year, 41 of the top 100 papers by circulation backed Obama, and 35 backed Romney. In 2008, the score was Obama 65, McCain 25. Monday Night Football Interviews: Both President Obama and Mitt Romney were interviewed at halftime of Monday Night Football on ESPN in what is becoming a tradition. Obama, who did a similar interview in 2008, won over more votes in Chicago when he said Bears cornerback Peanut Tillman deserves consideration for NFL Defensive Player of the Year. Tillman has returned two interceptions for touchdowns this season and forced four fumbles Sunday against Tennessee. In other news, Bears quarterback Jay Cutler announced his support for Mitt Romney. Election Day Forecast: Bring an umbrella. Forecasts call for rain to start between late morning in Chicago and last all day, with temperatures in the mid-40s. 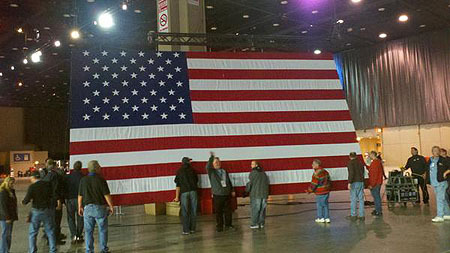 Smart move by the Obama campaign to hold the watch party inside McCormick Place rather than outdoors at Grant Park like in 2008. Voter intimidation: It's against the law to intimidate voters at polling places. If you are being intimidated by a poll watcher, or witness anyone being intimidated, you can report it to the FBI Voter Intimidation hotline at 202-514-1888.